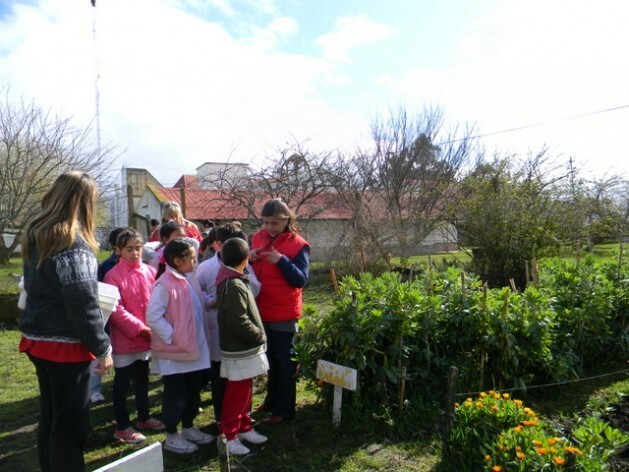 BUENOS AIRES, May 23 2015 (IPS) - In Argentina, where millions of families have unmet dietary needs despite the country’s vast expanse of fertile land, the Huerta Niño project promotes organic gardens in rural primary schools, to teach children healthy eating habits and show them that they can grow their own food to fight hunger. Of the 105 students who board Monday through Friday at the La Divina Pastora rural school in Mar del Sur in the municipality of General Alvarado, 80 percent come from poor families. “Ten percent have nutritional deficiencies, from their first year of life, even from the period of breastfeeding or even the pregnancy itself. We see calcium deficiency, which can lead to cavities and affects growth,” the school principal, Rita Darrechon, told Tierramérica. The privately run public school, located 500 km southwest of the capital, serves children between the ages of six and 14, and a few older children who have repeated grades. The children live in rural or semi-urban areas in the eastern province of Buenos Aires. But most of them were raised without any farming culture or knowledge about or tools for agriculture. The aim of the non-profit institution founded in 1999 by businessman Federico Lobert is to help reduce hunger among students in rural schools. The gardens benefit 20,000 children in 270 rural schools in low-income areas, like La Divina Pastora. The vegetables and fruit they grow are eaten by the students in the school lunchroom. “It seems like a really good opportunity to promote, together, a healthy diet, using natural resources that are within their reach,” said Darrechon. According to the National Survey on Nutrition and Health, 35 percent of children in Argentina live in households with “unmet basic needs”. Of that proportion, only 53 percent receive food assistance from different social programmes. The regions with the highest percentages of children living below the poverty line are the northeast (77 percent) and the northwest (75.7 percent). Children with serious malnutrition are more vulnerable to falling ill, and they suffer from stunted growth, with lifelong consequences, Kuss said. The first step is putting up a fence around a half-hectare plot of land. “We teach them why they have to keep the fence in good repair, why it can be bad for our health if dogs or other animals get into the garden; they are taught that manure is a fertiliser but that dog feces aren’t,” she added. Meetings are held with the students, parents and teachers to determine what is needed, depending on the climate, the quality of the soil, and the access to water. The next step is to prepare the soil, and the students are taught how to plant and harvest, and they learn the complete cycle in both planting seasons – autumn-winter and spring-summer. “We explain what to do step by step, because it’s really nice when the tomatoes turn red and the lettuce sprouts, but what do you do later with the lettuce? Do you just pick the leaves? Or do you pull it up by the roots? Do you plant again or do you wait till the next season?” Kuss said. 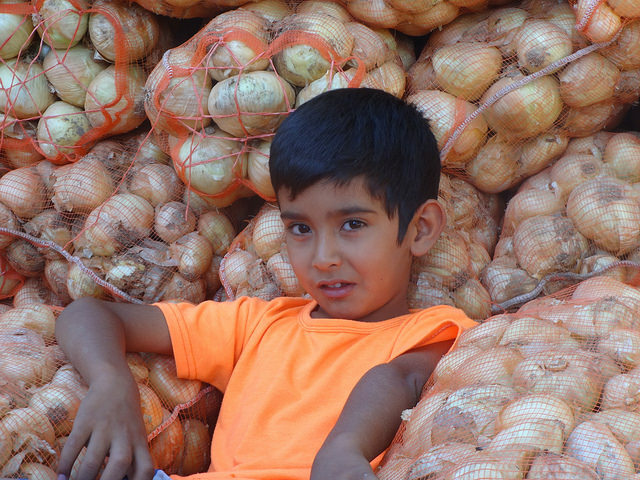 Huerta Niño has backing from the Education Ministry and receives technical support and seeds from Pro Huerta, an agroecological community programme run by the government’s National Agricultural Technology Institute. With donations from individuals, companies and organisations, it spends some 4,500 dollars on each school garden, providing tools adapted to children, agricultural supplies and inputs, and special expenses for windmills or specific irrigation systems. According to Kuss, community participation is essential for the project to be sustainable. “A garden needs attention. If you don’t control the pests, you don’t irrigate, you don’t weed, you don’t rotate the crops, it dies,” she said. “That would be a failure for the kids, which is the last thing they need, with the problems they already have,” she stressed. The initiative promotes agroecological practices that use organic fertilisers and pesticides. For example, aromatic flowers are planted to ward off insects. Chemical pesticides are not used, although surrounding fields are often sprayed. “We teach them that the tomato that grows in their garden might not be as big as the ones in the supermarket, but it will be red and tasty,” Kuss said. The garden forms part of the educational curriculum: from math (measuring the borders of the garden) to natural sciences and reading and writing (using instructional booklets). “It’s like an open-air laboratory. Learning through hands-on experience is much easier than learning by reading a book,” Darrechon said. Sometimes the students make their own gardens in their homes or communities, and some former students of La Divina Pastora have gone on to secondary school studies in agriculture. The initiative also teaches healthy eating habits – but not without running into certain difficulties. In schools in poor outlying semi-urban areas in Buenos Aires, some gardens have also helped combat violence and school dropout “by keeping kids in school with something interesting that keeps them off the streets,” said Kuss. The representative in Argentina of the United Nations Food and Agriculture Organisation (FAO), Valdir Welte, told Tierramérica that school gardens are playing an “extremely important” role in improving diets and eating habits and fighting hunger. “Children don’t only need to eat well; they must also learn about a healthy diet and learn how to grow their own food in case they need to,” said Welte. Kuss said these benefits from the gardens are as tangible as the fruit and vegetables produced.